One year ago, during the blooming period of the heath at the Posbank, I discovered a spot, which is now one of my favorite spots. Why? Well, it was one of the places that was still not really known to other photographers and therefore a quiet place to see the sunrise. But also because it is, in my opinion, a perfect spot for a panorama photo in which the trees are nicely aligned with in the background the lines of the various hills. 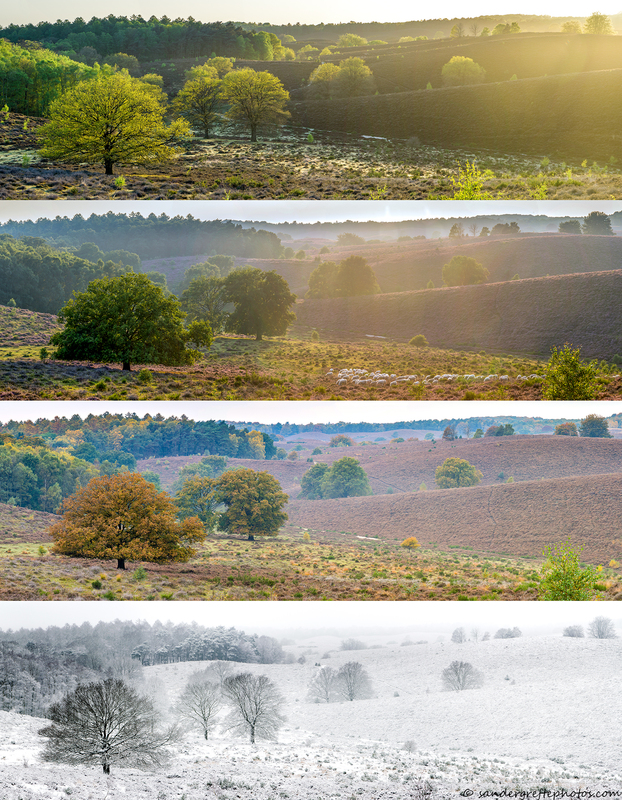 So here I decided to go for a 4 season panorama, which I finally finished…. Enjoy!! Op FB had ik al mijn lof over deze seizoenen compilatie ge-uit. Heel fraai resultaat. Toch blijft de z/w keuze voor het winterlandschap vreemd, daardoor valt deze wat uit de toon. Maar dat het blijft een geweldig resultaat. Dank je Peter. Je had gelijk, het was idd in zwart wit. Het is aangepast, maar er zit niet veel kleur in.